Handmade Heart & Cross Necklaces Now Available!! It's the necklace all my friends keep asking about, and we're so excited to share them with you! They're just in time for Easter and Mother's Day! Each piece is beautifully hand crafted and hand painted. Hearts are approximately 1inch in size. Crosses are approximately 1.5x1 inch in size. Both necklaces are adjustable from 16 to 18 inches and have a scripture inscribed on the back. A fabric drawstring bag, sewn by a Kenyan friend, is also included for safekeeping. Heart necklaces are $22.00 each. 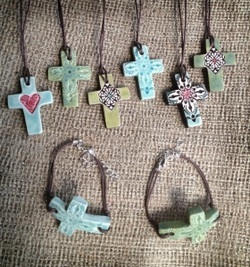 Cross necklaces and bracelets are $24.00 each. All proceeds from jewelry sales will be used toward our international travel expenses. Please leave a message indicating items and quantities here. Thank you for your support! Front Message: CHOSEN Back Message: 146,999,999 Million Orphans I will not leave you as orphans, I will come to you. John 14:18 Soft, Ring Spun Cotton Material. Men, Women's Fitted, and Youth sizes available. Please note: European Cut- Sizes run small. What a beautiful way to support adoption! These paper beads were rolled from recycled paper and handmade in Uganda. We purchase the beads through a ministry working to eradicate poverty and empower African women. Our family then strings the beads into these beautiful light-weight bracelets and uses the profit to help fund our Ethiopian adoption. It's a win-win! The unique quality and color of the beads are guaranteed to spark conversation. I love using the beauty of the bead story to tell about the beauty of adoption. A must have! Yours for $7 each. To order, click Donate below. List order, including color in the memo box. 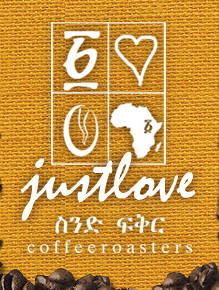 We LOVE coffee, and it just so happens that Ethiopia produces some of the BEST coffee in the world! We have partnered with Just Love Coffee for an adoption fundraiser. Just Love Coffee sells organic and Fairtrade coffee from around the world. They donate $5 to our adoption for each bag sold. Purchasing organic, fair trade coffee a great way to assist our adoption efforts while contributing to the livelihood of Ethiopian farmers. Please visit www.justlovecoffee.com/growingthemartinezfamily to make your purchase today!